This lane leading to Croxley Woods is named after the nearby All Saints Church which was consecrated on 25th June 1872. It was built using Bath stone in the early English style and the first Vicar was Rev. Astley Roberts. 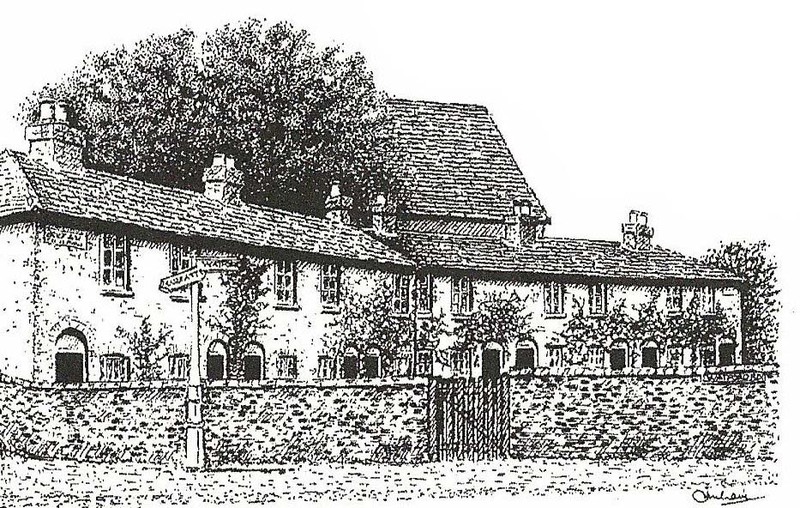 Situated alongside the church were Berean Cottages, (known locally as 'Penny Row'), which were built c.1837 as almshouses for the elderly in dire need and run by a charity instituted by Mr Woods the owner of Durrants House. These 'one-up-one-down' cottages were let for the nominal rent of one penny per week making four shillings and four pence per year - which would translate to twenty two pence in decimal currency. After the First World War the cottages were let out to ex-Servicemen for one shilling per week and soon became known as 'Heroes Terrace: They were later demolished, the tenants re-housed in Gonville Avenue and the Church Hall constructed on the site, opening in November 1932. The lane is said to be named after Margaret Baldwine whose name appeared in the parish records for 1581. The Baldwin, Baldwine or Baldwyn family settled in South West Hertfordshire in the fifteenth and sixteenth centuries, and resided at Redheath for two hundred years when the house was bequeathed to their nephew Charles Firth in 1710 following the death of the last family member. Significantly, it was William Baldwin who first leased the Manor of Croxley from 'the Crown in 1538 for forty four years. The lane was still undeveloped by 1925 as the Kelly's directory lists only 'Lower Lodge', During the 1930s the land between the cornfields and the Durrants Estate was slowly developed. The two lodges and parts of the holly hedges from this old estate do however, still remain today along the lane. Following the Second World War period new housing and two shopping parades were constructed. The Baptist Church was built in 1952 and opened in April of the following year having grown from the temporary church of the 1940s. St Bede's Roman Catholic Church, which first held its services in the British Restaurant in Winton Drive, also stands adjacent to the Lane. The origin of the name lay in Councillor Charles Barton-Smith, who as general Manager of Dickinson Mill lived at "Lindiswara" a large house in Watford Road, (demolished in 1963 and now the site of modern flats). In 1898 he won three hundred and eighty three votes, the highest number of any single candidate in the Rickmansworth Urban District Council (U.D.C.) and later became Chairman in 1904. He was closely associated with the development of the Dickinson Institute (known as 'The Tute'). In 1895 he is recorded as having held a small meeting in a house in Dickinson Square which was the beginning of the Institute, a club and reading room for employees. Later he was to persuade the directors to build a better hall, (the largest of its kind in the area) which was opened on 5th November 1896 with a concert and fireworks display. The Barton-Smith family were always well known in the area and Miss May Barton-Smith issued library books at the Guildhouse in 1943; technical, cookery and dancing classes were also held there. Barton Way was developed in the 1930s as part of the Metroland expansion, on land which was formerly part of the Parrotts Estate, with the variety of house styles indicating the different builders involved in the development. Part of this development was the designation of land as Recreation and Playing Fields, which are reached via a footpath from Barton Way. 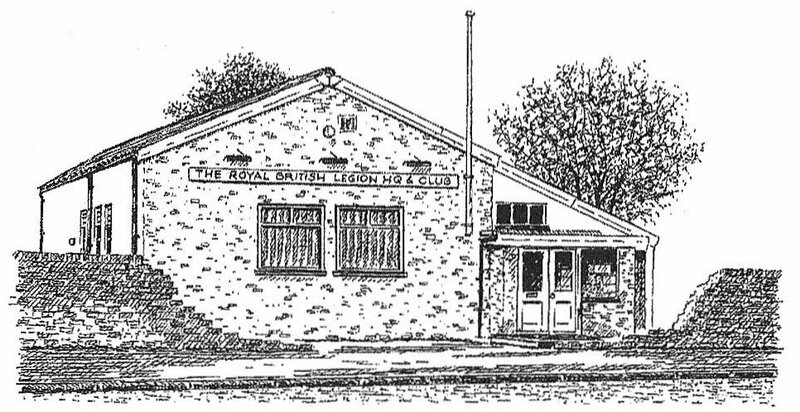 Croxley library, (which had previously been held at 146 Watford Road in an empty shop), was opened on 12th July 1966 on the former site of two cottages and an orchard. Unfortunately, this was to be destroyed by fire on the night of 28th/29th December 1992 but was rebuilt in 1994. Adjoining the library stands the Red Cross Centre which although damaged by the fire in 1992 was not lost. To the side of the Red Cross Centre runs a service road which passes the Croxley Green Horticultural Society, the allotments and leads to the Recycling Centre, Community Centre and Parish Council office. Opposite the library, in the garden of the house on the corner of Barton Way and New Road, stands a Celtic Cross which is the Dickinson War Memorial commemorating those employees who died in both world wars. In 1558, the Manor of Croxley was given to Gonville and Caius College, Cambridge by Dr John Caius who became Royal Physician to Edward VI, Queen Mary I and Queen Elizabeth I. When Croxley was developed in the 1930s this connection with the College was commemorated by naming five roads after benefactors f the College. One of these was Edmund Gonville, who founded Gonville Hall in 1348 as part of the College in Cambridge. When he died his executor William Bateman moved Gonville Hall to its present day site in Cambridge. Bateman was also the Bishop of Norwich and was educated at the College. Housing in this road was developed as part of the Nuttfield Estate during the late 1920s and early 1930s as part of the Metroland expansion. Other roads in this group are Frankland Close; Frankland Road; Gonville Avenue and Harvey Road. This road was part of the development in the 1930s on fields between Watford Road and the Grand Union Canal on land which was formerly part of the Cassiobridge Estate owned by Gonville and Caius College. The roads which formed this development were all named after trees. Other roads in this group are Hazelwood Road; Oakleigh Drive and Sycamore Road. The Durrants Farm Estate which was sold in 1932/1933 led to the slow development of the area between Baldwins Lane and Little Green Lane at the hands of a number of different builders and at different times, hence the eclectic and varying styles which are found today. The roads in this development took their names from famous historic towns and cities. Building was started in the 1930s but interrupted by the Second World War which brought all building work to a halt and hence these roads were not completed until much later. Other roads in this group are Dover Way; Hastings Way; Kenilworth Drive; Lewes Way; Lincoln Drive; Lincoln Way; Ludlow Way; Norwich Way; Richmond Way; Rochester Way and Warwick Way. The close was built on part of the Yorke Mead School field by Barratts in 1986/1987 as sheltered accommodation for the elderly. The different designs of flats and bungalows were named after rivers including 'Nene', 'Hamble', and 'Cherwell'. The road took its name from the design of the first set of bungalows. Named due to its close proximity to the River Chess; the road leads off Copthorne Road. 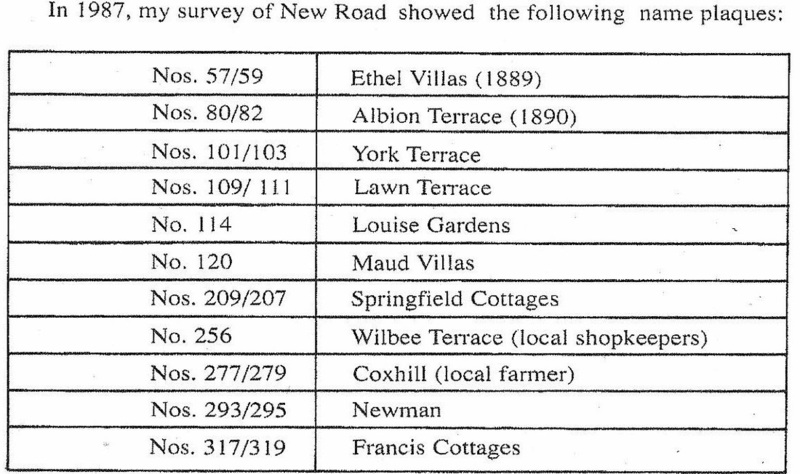 In the 1930s development of the former Parrotts Estate land, between New Road and Baldwins Lane, many roads were named after Colleges and Schools. Building was started in the 1930s but interrupted by the Second World War which brought all building work to a halt and hence these roads were not completed until much later. The development was by a number of different builders and at different times hence the eclectic and varying styles which are found today. Other roads in this group are Dulwich Way; Fuller Way; Girton Way; Lancing Way; Malvern Way; Repton Way; Rugby Way; Sherborne Way; Winchester Way; Winton Approach; Winton Crescent and Winton Drive. In 1194 the Hospital of St Mary de Pre at Saint Albans was granted "two acres beyond the spinney called Le Copdethorne" by the monastery. The historian Necorne is also noted for mentioning Copthorne Wood. 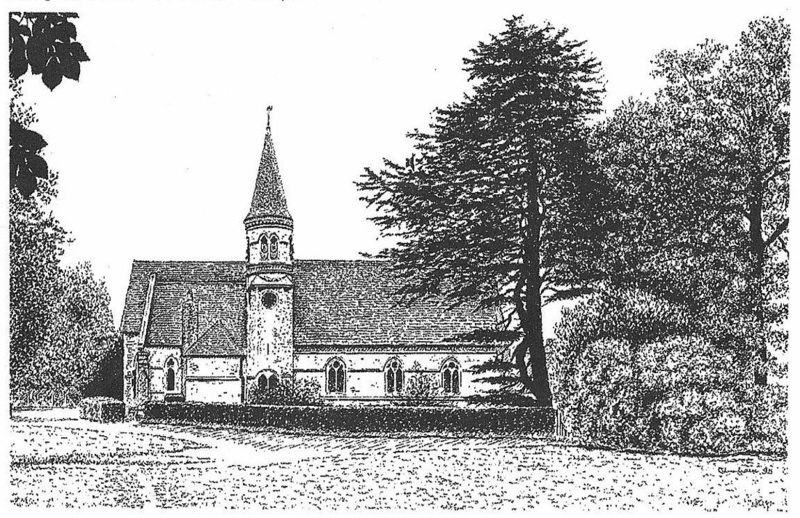 Copthom was represented graphically on the 1777 tithe map, and is translated as meaning a pollarded thorn tree. At the entrance to the road there once stood a blacksmiths shop where horses from the farms in and around the Green were shod. The first record of Copthorne Road can be found in the 1905 Kellys Directory. An incendiary bomb fell nearby on 5th January 1941. A small development leading off Scots Hill built in 1989 near to Scots Hill Cottage. Names suggested at the time included Scots Hill Heights and Pembroke Court. The Council chose Cottage Close, which was suggested by Councillor Sheila Wright. A cul-de-sac situated off the Watford Road of 1930s style housing. 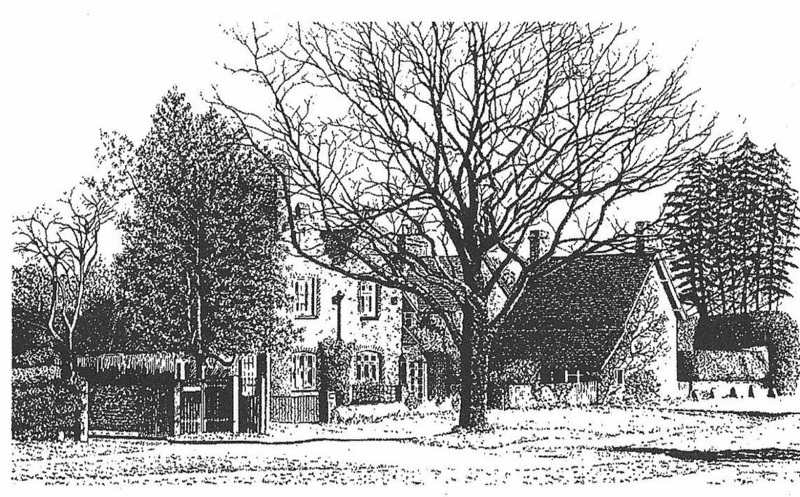 John Dickinson helped Croxley to grow by providing land for the village school and employment at his mill from 1829 until its closure in 1980. The roads serve as a reminder of his life and work. Sixteen acres of land were bought from Gonville and Caius College which were known as Milestone Field, named after the old milestone on this site from the Hatfield to Reading Turnpike Trust, which read '1 mile to Rickmansworth '. The cottages in the Square and Avenue were built in the late 1880s/1890s for the employees at the John Dickinson Croxley Paper Mill. In the middle of the Square gardens there stood a bandstand, whilst at No.5 Milestone Field, (i.e, Dickinson Square), Croxley's first Co-op shop was opened in 1887. The Kelly's Directory lists five houses in this area for 1914-15 and by 1940 the rent was 9 shillings (45p) per week. The original housing has been supplemented by infill building in more recent years. See also under Barton Way. Built in the 1960s, it was named after a well known local family, of which Thomas Dorrofield was a watercress grower; George Dorrofield lived at Loudwater Farm, whilst another was the licensee of the Swan Inn, Rickmansworth. Other family members resided in Croxley. The Durrants Farm Estate which was sold in 1932/1933 led to the slow development of the area between Baldwins Lane and Little Green Lane at the hands of a number of different builders and at different times, hence the eclectic and varying styles which are found today. The roads in this development took their names from famous historic towns and cities. Building was started in the 1930s but interrupted by the Second World War which brought all building work to a halt and hence these roads were not completed until much later. Other roads in this group are Canterbury Way; Hastings Way; Kenilworth Drive; Lewes Way; Lincoln Drive; Lincoln Way; Ludlow Way; Norwich Way; Richmond Way; Rochester Way and Warwick Way. This development was built on part of the garden of the Grove House, now converted to flats. 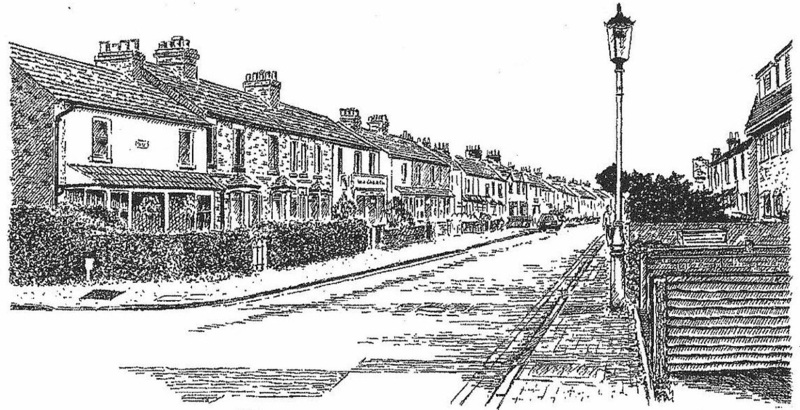 Dugdales was the name of the family which lived in the Grove at the turn of the last century and this corner of Baldwins Lane and the Green became known locally as 'Dugdales'. In the 1930s development of the former Parrotts Estate land, between New Road and Baldwins Lane, many roads were named after Colleges and Schools. Building was started in the 1930s but interrupted by the Second World War which brought all building work to a halt and hence these roads were not completed until much later. The development was by a number of different builders and at different times hence the eclectic and varying styles which are found today. Dulwich Way is one of the roads built at the later stages of this development hence the more modern appearance. Yorke Mead School was opened here in 1974 when the old village school in Yorke Road was finally closed. Other roads in this group are Claremont Crescent; Fuller Way; Girton Way; Lancing Way; Malvern Way; Repton Way; Rugby Way; Sherborne Way; Winchester Way; Winton Approach; Winton Crescent and Winton Drive. This road takes its name from Durrants Farm Estate, which originates from 1278 when a Croxley farmer was listed as Simon Duraunt, His name suggests links to Du-Ranee, (a river in Normandy) which indicates that he may well have been a Norman, who was farming land given as a gift by William the Conqueror. Between 1866 and 1867 a Manor House was built for a fine art auctioneer Thomas Woods on land originally leased from Gonville and Caius College. The estate, which totalled two-hundred and twenty four acres, stretched from Baldwins Lane to the far side of Little Green Lane. On the death of the foIIowing owner, Mr C. Morland Agnew, the estate was sold in 1932 and the area was slowly developed for housing until building was interrupted by the Second World War. This resulted in a mixture of part 1930s housing and part post-war. Durrants House has since become a thriving Country Club and the estate's two lodges, (situated on Baldwins Lane), still remain. This road was built on land adjoining Elmcote House. 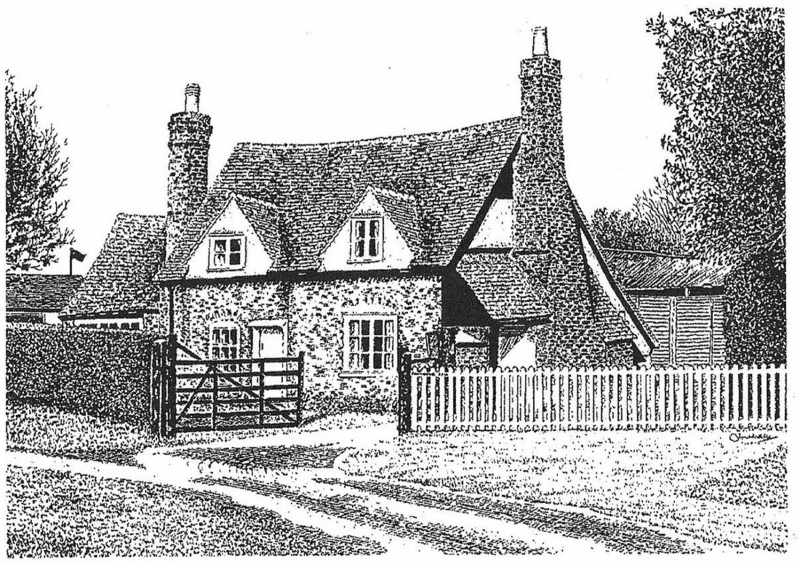 In 1935 the local directory lists 'Elmcote', 'The Lodge' and 'Elmcote Cottage'. From 1969 to c.1991 Elmcote House was the headquarters of McInemey Homes Ltd and was known as McInemey House. It reverted to its original name when Mclnerney Homes Ltd went into receivership and is now occupied by Mount Anvil Ltd. This is a recent development built in 1980-81 which contains eighteen houses and four flats on the site of Lawn Villa, 89 New Road, and an orchard. Names suggested to the council were Blenheim Close, Park View, Clarence Place and The Oaks. During the naming the Post Office objected to Park View, claiming it sounded too similar to other road names, the naming was then referred to the council's committee for their view. It was decided at a later date to name the road after the well known local family of Evans who were related by marriage to the Dickinson family and whose land adjoined that of the Close. These roads take their name from a benefactor of Gonville and Caius College, Cambridge who once owned the Manor of Croxley. In 1587 Mrs Jocasa (Joyce) Frankland, a great benefactress also of Brasenose College, Oxford, left endowments for six fellowships, a chaplaincy and six scholarships in her will. The housing dates from the late 1920s to the early 1930s when the Nuttfield Estate was developed as part of the Metroland expansion. Fuller Way is part of the 1930s development of the former Parrotts Estate land, between New Road and Baldwins Lane, in which many roads were named after Colleges and Schools. Building was started in the 1930s but interrupted by the Second World War which brought all building work to a halt and hence these roads were not completed until much later. The development was by a number of different builders and at different times hence the eclectic and varying styles which are found today, Towards the end of Fuller Way is an area of later infill building. Fuller Way Church, the meeting place of the Christian Fellowship, stands along this road. The first meetings were held in a workshop at Lindsays Yard, Scots Hill in 1892, until the Gospel Hall was built at Scots Hill in 1894. The building was damaged in 1944 and later demolished. Services continued in Dickinson's Guildhouse, people's homes and a schoolroom at the Methodist Church. After the Second World War the present site was purchased and a prefabricated, corrugated iron church was re-erected on this site. The present building was opened in 1959. Other roads in this group are Claremont Crescent; Dulwich Way; Girton Way; Lancing Way; Malvern Way; Repton Way; Rugby Way; Sherborne Way; Winchester Way; Winton Approach; Winton Crescent and Winton Drive. In the 1930s development of the former Parrotts Estate land, between New Road and Baldwins Lane, many roads were named after Colleges and Schools. Building was started in the 1930s but interrupted by the Second World War which brought all building work to a halt and hence these roads were not completed until much later. The development was by a number of different builders and at different times hence the eclectic and varying styles which are found today. Other roads in this group are Claremont Crescent; Dulwich Way; Fuller Way; Lancing Way; Malvern Way; Repton Way; Rugby Way; Sherborne Way; Winchester Way Winton Approach; Winton Crescent and Winton Drive. This road was built in 1921 and was the first council house estate in the Urban District of Rickmansworth. Some of the first occupants were rehoused from Berean Cottages, known as Heroes Terrace, at All Saints Church when their homes were demolished to make way for the Church Hall. The name comes from Edmund Gonville, a Norfolk parish priest, who in 1348 obtained royal permission to create a college. In 1558, the Manor of Croxley was given to Gonville and Caius College, Cambridge by Dr John Caius who became Royal Physician to Edward VI, Queen Mary I and Queen Elizabeth I. When Croxley was developed in the 1930s this connection with the College was commemorated by naming five roads after benefactors of the College. The name derives either from a field name, or, a former manor of Croxley. For centuries the Green was the centre of village life, with the entire hamlet, which consisted of a few houses and farms, being situated around its periphery. The Green was also the site for the Annual Fair, held on August Monday, cricket matches and the 'Cherry Fair', or 'Cherry Sundays', which were held on three consecutive Sundays in July. During the cherry harvest visitors flocked to the 'counters' set up between Stones' Orchard and Parrotts. Local farmers had grazing rights for flocks of sheep and herds of cattle over twenty-eight acres of the Green. Hollow Tree, Parrotts and Killingdown were all early farms that skirted the Green. Croxley House was built in 1770 for Thomas, Lord Hyde, later the Earl of Clarendon, The house has since been enlarged by its various owners and has been a W.V.S. home for the elderly since 1949. Its public houses 'The Artichoke' and 'The Coach and Horses' date from the seventeenth century and have been subject to numerous changes since. 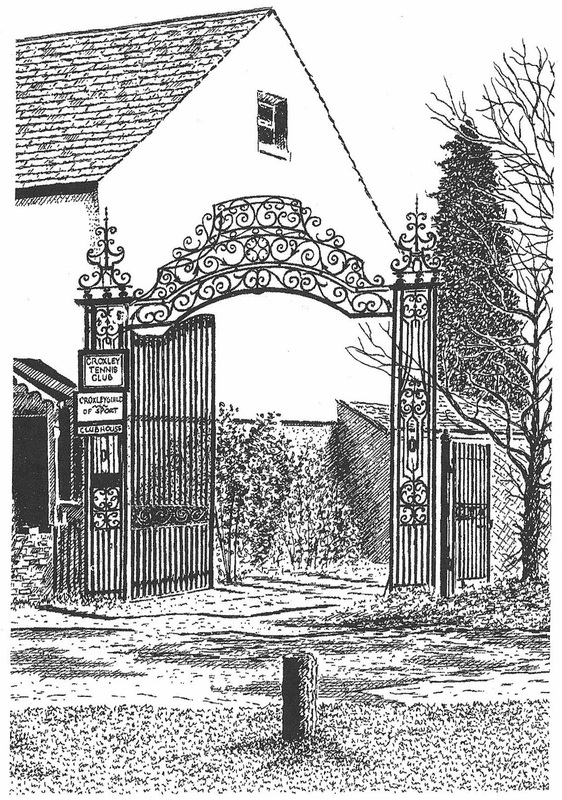 Next to 'Providence Hall', another of the older houses, is the entrance to Croxley Guild of Sport (formerly Dickinson s Sports Field) with the notable feature of the historic wrought iron gates which were erected by the Croxley Cricket Club. These gates belonged to Christie's director Mr Thomas Woods', who placed them by one of the lodges to the Durrants Estate where he lived. On Mr Woods death the estate was bought by Mr C. Morland Agnew, who allowed Croxley Cricket Club to play in his park. Following his death the estate was divided up and the gates given to the Cricket Club. Several memorial trees have been planted to commemorate coronations and special events. The War Memorial remembers those who died in the two World Wars, together with the recent addition in 1994 of a commemorative stone to mark those in the British Armed Services and Civilians who gave their lives during and after the Korean War. The Green also had five ponds known as 'Stones', 'Streeters', 'Little Green', 'Coxhills' and 'Robinson's'. At the edge of the Green, next to All Saints Church, is a horse trough which was donated by the Metropolitan Drinking Fountain and Cattle Trough Association in the 1880s. 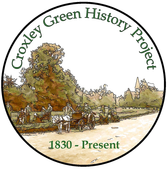 The Friends of the Green was formed in 1973 and in March 1980 the Green was designated a conservation area, thus ensuring the protection of its old English character. A short road leading to the Green (see above). A cul-de-sac of large detached houses surrounding a row of Scots Pine trees, from which a pathway leads to Copthorne Road. At the entrance to the road from The Green stands the Artichoke Public House. Off Green Lane is a cut-de-sac named The Orchard on the Green. 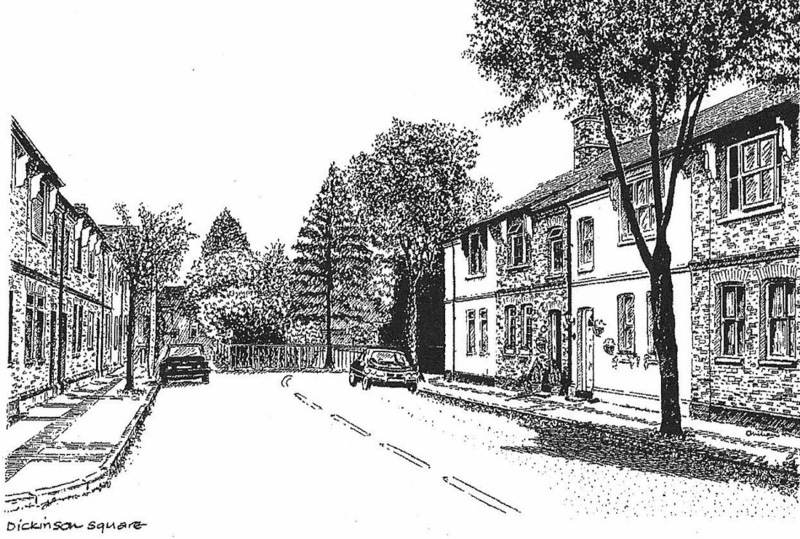 In the mid-1980s L. A. T. Rayner & Sons purchased the site of 'The Orchard', a 1930s detached house, and horticultural land to the rear with a view to developing the site for housing with an access road. From 1986 to 1992 various plans were submitted to Three Rivers District Council. 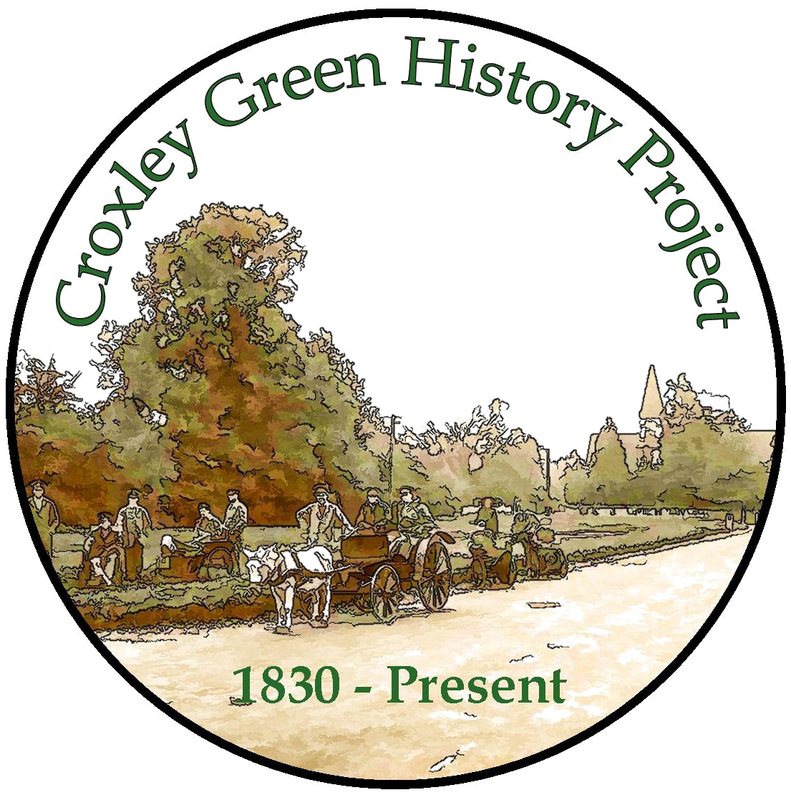 There was much opposition to the plan from Croxley Green Parish Council, Friends of the Green and Copthorne Residents Society. Finally amended plans were passed by the council and permission to demolish 'The Orchard' was given. In 1993 six large detached houses were built here. Situated at the junction of The Green and Baldwins Lane is a large house known as The Grove which was built in 1834 for Miss Mary Bentley, the owner of Killingdown Farm which is on the adjacent Little Green Lane. The Grove has now been converted to flats. 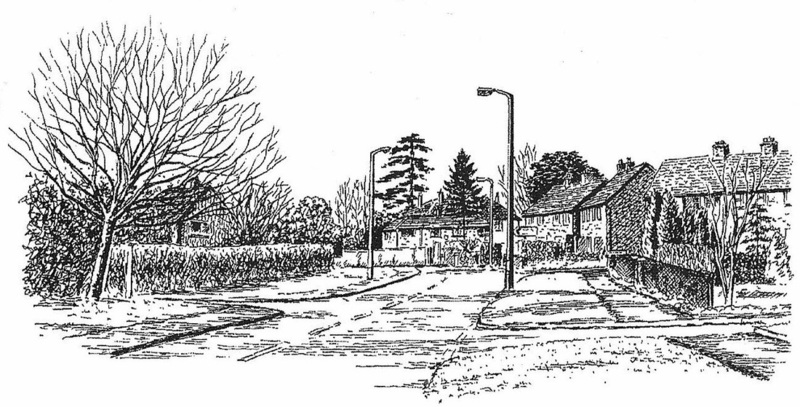 In 1946/1947 Rickmansworth Urban District Council built an estate of prefabs on part of the land belonging to the estate. The lanes were named Ash, Holly, Gorse, Ivy and Lime, after different varieties of trees and shrubs. These were demolished and the site was redeveloped as Grove Crescent. In 1973 the Grove Crescent warden-managed flats for the elderly were opened by Miss Muriel Pavlow. In 1558, the Manor of Croxley was given to Gonville and Caius College, Cambridge by Dr John Caius, who became Royal Physician to Edward VI, Queen Mary I and Queen Elizabeth l. When Croxley was developed in the 1930s this connection with the College was commemorated by naming five roads after benefactors of the College. Harvey Road was named after William Harvey, the great physiologist accredited with the discovery of the circulation of the blood. He entered the College in 1593 and later became the physician to James I. The housing was developed from 1926 as part of the Nuttfield Estate during the Metroland expansion. By 1938 the village school in Yorke Road was seriously overcrowded and after it was partly destroyed by fire the senior pupils were moved into hastily constructed wooden buildings. These same temporary buildings are still part of Harvey Road Junior School. Other roads in this group are Bateman Road; Frank land Close; Frankland Road and Gonville Avenue. The Durrants Farm Estate which was sold in 1932/1933 led to the slow development of the area between Baldwins Lane and Little Green Lane at the hands of a number of different builders and at different times, hence the eclectic and varying styles which are found today. The roads in this development took their names from famous historic towns and cities. Building was started in the 1930s but interrupted by the Second World War which brought all building work to a halt and hence these roads were not completed until much later. Hastings Way is a cul-de-sac with views at the end over the Old Merchant Taylor 's Playing Fields. Other roads in this group are Canterbury Way; Dover Way; Kenilworth Drive; Lewes Way; Lincoln Drive; Lincoln Way; Ludlow Way; Norwich Way; Richmond Way; Rochester Way and Warwick Way. This road was part of the development in the 1930s on fields between Watford Road and the Grand Union Canal on land which was formerly part of the Cassiobridge Estate owned by Gonville and Caius College. The roads which formed this development were all named after trees. Other roads in this group are Beechcroft Avenue; Oakleigh Drive and Sycamore Road. 1777 Tithe Map shows 'Jaggerts Hill' and 'Jaggerts Bridge'. The Durrants Farm Estate which was sold in 1932/1933 led to the slow development of the area between Baldwins Lane and Little Green Lane at the hands of a number of different builders and at different times, hence the eclectic and varying styles which are found today. The roads in this development took their names from famous historic towns and cities. Building was started in the 1930s but interrupted by the Second World War which brought all building work to a halt and hence these roads were not completed until much later. Other roads in this group are Canterbury Way; Dover Way; Hastings Way; Lewes Way; Lincoln Drive; Lincoln Way; Ludlow Way; Norwich Way: Richmond Way; Rochester Way and Warwick Way. In the 1930s development of the former Parrotts Estate land, between New Road and Baldwins Lane, many roads were named after Colleges and Schools. Building was started in the 1930s but interrupted by the Second World War which brought all building work to a halt and hence these roads were not completed until much later. The development was by a number of different builders and at different times hence the eclectic and varying styles which are found today. Other roads in this group are Claremont Crescent; Dulwich Way; Fuller Way; Girton Way; Malvern Way; Repton Way; Rugby Way; Sherborne Way; Winchester Way, Winton Approach; Winton Crescent and Winton Drive. An unmade road leading to a field of the same name - a former word for Lark. From here footpaths lead towards Croxley Hall Farm, one of the Croxley Manor farms. The actual farm house is believed to date from the sixteenth century. The tithe barn is much older, being built between 1396 and 140I. It is one of the largest of its type at thirty metres long, twelve metres wide and ten metres high. During the reign of Henry VIII, it became known as 'Wolsey's Slaughterhouse' because it was reputed to be used to slaughter animals as meat for the many banquets held by Cardinal Wolsey at his nearby Palace of the More. During the English Civil War it is said Cromwellian soldiers were billeted in the barn. Hertfordshire County Council purchased the barn in 1973 and it was restored extensively. Other roads in this group are Canterbury Way; Dover Way; Hastings Way; Kenilworth Drive; Lincoln Drive; Lincoln Way; Ludlow Way; Norwich Way; Richmond Way; Rochester Way and Warwick Way. The Durrants Farm Estate which was sold in 1932/1933 led to the slow development of the area between Baldwins Lane and Little Green Lane at the hands of a number of different builders and at different times, hence the eclectic and varying styles which are found today. The roads in this development took their names from famous historic towns and cities. Building was started in the 1930s but interrupted by the Second World War which brought all building work to a halt and hence these roads were not completed until much later. Little Green Junior School was opened here in May 1949. Other roads in this group are Canterbury Way; Dover Way; Hastings Way; Kenilworth Drive; Lewes Way; Lincoln Way; Ludlow Way; Norwich Way; Richmond Way; Rochester Way and Warwick Way. The Durrants Farm Estate which was sold in 1932/1933 led to the slow development of the area between Baldwins Lane and Little Green Lane at the hands of a number of different builders and at different times, hence the eclectic and varying styles which are found today. The roads in this development took their names from famous historic towns and cities. Here is the entrance to the Durrants Club and Old Merchant Taylors Playing Fields. Durrants House was built between 1866 and 1867 for fine art auctioneer Thomas Hoade Woods. By 1903 the estate had a long carriage drive with lodge entrances, high ornamental gates, a croquet lawn, kitchen gardens, bailiff's house, farm buildings and totalled two hundred and twenty four acres. When the second owner, another art dealer, Mr. C. Morland Agnew, died in the early 1930s the estate was sold to Braceys Builders. In the following five years streets of suburban semis crept towards the main house. Building stopped and the estate was sold to Old Merchant Taylors Sports Club. They soon began to convert the estate into a clubhouse with rugby, football and cricket pitches. Later the old conservatory was demolished making way for a squash court. The house is now a thriving country club. Other roads in this group are Canterbury Way; Dover Way; Hastings Way; Kenilworth Drive; Lewes Way; Lincoln Drive; Ludlow Way; Norwich Way; Richmond Way; Rochester Way and Warwick Way. This leads to the golf links and was mainly developed in the 1930s with more recent additions. The lane leads from The Green to Rousebarn Lane, with a junction near Little Green Cottages which returns to the road to Sarratt at the end of the wall surrounding Croxley House. The stretch from Batdwins Lane to the eighteenth century Little Green Cottages was originally known locally as Chapel Lane. 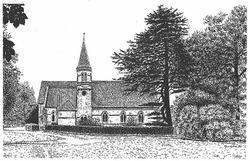 It took its name from the Old Dissenting Meeting House which stood on the lane where early services were held. 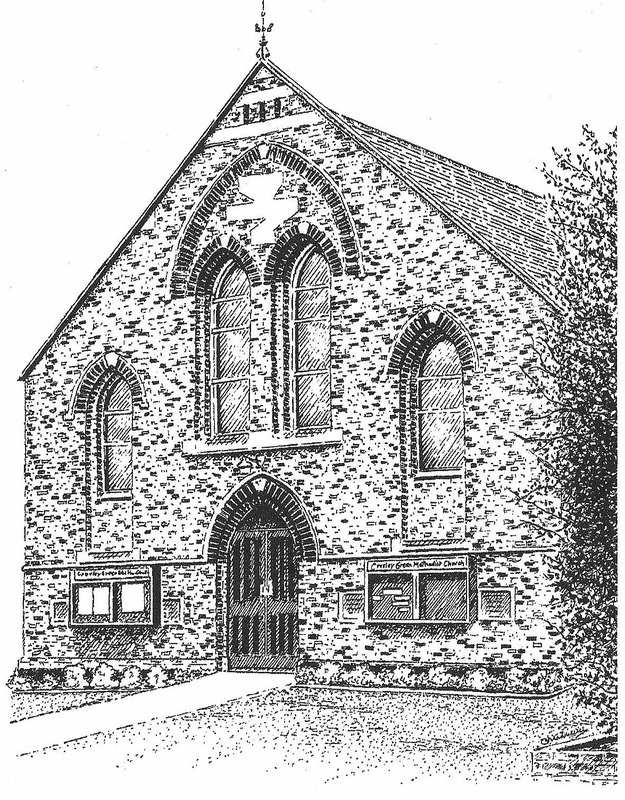 The next meeting house was the Methodist Chapel in New Road built in 1868 which was then replaced by the current building in 1893. The upper part of the lane which runs behind Croxley House was originally known as Durrants Lane. It was renamed Little Green Lane by Rickmansworth Urban District Council in the 1950s. In 1978 the Council investigated the matter as some confusion had arisen. It was decided to reaffirm the name Little Green Lane and changed the nameplates accordingly. Waterdell House is situated on this part of the lane. Leading from Rousebarn Lane this is a modern development of four houses and The Lodge. This took its name from a local farm. The Durrants Farm Estate which was sold in 1932/1933 led to the slow development of the area between Baldwins Lane and Little Green Lane at the hands of a number of different builders and at different times, hence the eclectic and varying styles which are found today. The roads in this development took their names from famous historic towns and cities. Building was started in the 1930s but interrupted by the Second World War which brought all building work to a halt and hence these roads were not completed until much later. Other roads in this group are Canterbury Way; Dover Way; Hastings Way; Kenilworth Drive; Lewes Way; Lincoln Drive; Lincoln Way; Norwich Way; Richmond Way; Rochester Way and Warwick Way. St Oswalds Parish Church was built here in 1937 as a church and hall combined with removable partitions screening the altar and choir stalls. During the Second World War it was used as a school for children evacuated to Croxley Green, who together with adults numbered some six hundred. This temporary school was replaced by Malvern Way School, opened officially in May 1949. The Vicarage was built in 1958 in Baldwins Lane replacing ·the original one in Winton Drive. 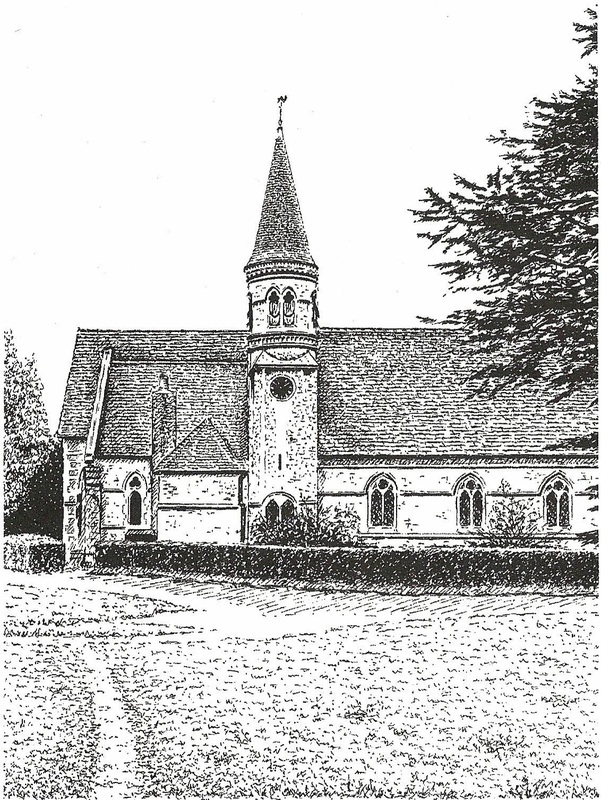 In 1962 the Church became a parish in its own right and later, in 1985, the Shaftesbury Society built the Shaftesbury Court sheltered accommodation on the site of allotments behind St Oswalds Church. Other roads in this group are Claremont Crescent; Dulwich Way; Fuller Way; Girton Way; Lancing Way; Repton Way; Rugby Way; Sherborne Way; Winchester Way; Winton Approach; Winton Crescent and Win ton Drive. This road was built on land from the Durrants Estate in the 1930s as part of the Metroland development and later in the decade Durrants School was constructed at the end of the road. Durrants served the area as an excellent secondary school from 1939 until it was closed on 26th July 1991. The school site was then sold and redeveloped as a housing estate in 1993, when Bellway Homes built the Ferndown estate. This new estate was built in 1972/1973 by Hunting Gate Ltd of Hitchin on a five acre site alongside the A412, Watford Road. The site had originally been the L.M.S. railway goods yard, was later used as coal yard and housed the Lynwood Joinery Works. The development to be called Mayfare comprised of fifty one three and four bedroom town houses. They were designed by the developers' own team of architects " ..to convey a sense of Georgian luxury and good living ..". To ensure maximum privacy from the busy Watford Road the housing was planned around four spacious enclosed garden courtyards, each house having its own secluded and enclosed rear garden. The houses were aptly named Berkeley Court, Cavendish Court, Dorchester Court and Grosvenor Court after famous squares in the Mayfair area of London. Mill lane leads to the Grand Union Canal and Common Moor and was used for many years by the employees of John Dickinsons Paper Mill as they went back and forth to work. It was by the side of Common Moor Lock that John Dickinson's paper mill stood, one of its famous products being the 'Croxley Script' range of stationery. During the peak of its prosperity there was almost a quarter of a mile of covered loading bays and the company was one of the last canal side businesses to get supplies of coal direct from the narrow boat. A special Act of Parliament was passed in 1828 to enable the mill to be built on common land. Croxley Common Moor is an area of low-lying grassy heath land close to the River Gade and about forty hectares (one hundred acres) in size. The area is a Site of Special Scientific Interest (SSSI) and is owned by Three Rivers District Council with one local farmer exercising his grazing rights. The mixture of sandy and chalky soils allows a variety of plants, insects and birds to exist here. A cul-de-sac which leads off Copthorne Road was built in 1965. Suggested names included Thorn Close but it was adopted as Millthorne. Originally known as the Croxley New Road it began as a footpath between the Red House and the Artichoke public houses. The first houses were built in the 1860s when land from Hollow Tree Farm was sold for building development. 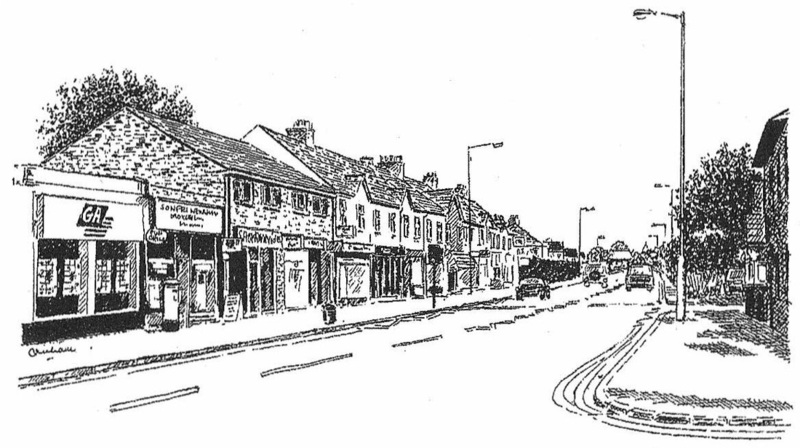 It was re-named New Road in 1898 and slowly became the centre of village life with new shops and houses. The Red House, on the corner with Watford Road, although much older, was not identifiable as a public house before 1870, when the publican was a George Williams. The Rose public house stood next to the Red House at 276 New Road and is now the site of flats. The Fox and Hounds further up the road dates from the mid-nineteenth century, when William Banting, a beer retailer, bought the land. The first shops appeared at the turn of the century. The Co-op was on its present site and opposite was the grocery shop of J. Dimmock which was also a Parcel Office for the L.N.W. Railway. At 170 was Foster's dairy, more recently the premises of Bakers Estates and where New Road Service Station is now situated was the site of a blacksmith, wheelwright and painters. Other roads in the group are Cantebury Way; Dover Way; Hastings Way; Kenilworth Drive; Lewes Way; Lincoln Drive; Lincoln Way; Ludlow Way; Richmond Way; Rochester Way and Warwick Way. A cul-de-sac off Frankland Road which was built on land formerly the Nuttfield Estate in the 1930s by Croxley Estates Limited. Nuttfield House was built here for the manager of Croxley's Dickinson Mill in 1891 and later let to a succession of tenants. The house stood in four acres of ground and comprised a drawing room, dining room, seven bedrooms, kitchen, garaging for two cars, stables and greenhouse. It was one of the first houses in the area to have electric light which was supplied by the mill. It was sold to Croxley Estates Limited for two thousand, two hundred and fifty pounds during the early 1930s. It takes its name from the old field names in the area, which also included: Hither Nut Field and Further Nut Field. This road was part of the development in the 1930s on fields between Watford Road and the Grand Union Canal on land which was formerly part of the Cassiobridge Estate owned by Gonville and Caius College. The roads which formed this development were all named after trees. Other roads in this group are Beechcroft Avenue; Hazelwood Road and Sycamore Road. This is a cul-de-sac of attractive detached houses which leads off The Green. The Coach and Horses Public House stands at the junction with The Green. A gap had been left in Repton Way as a building plot for two houses and when building resumed after the Second World War this was used as the entrance for Owens Way. Interestingly until recent times the road was split by a large tree. The first people moved in during 1949, many of whom had been living in the prefab estate at the top of Baldwins Lane which was later developed into Grove Crescent. This road of modern houses is built on Parrotts farmland, one of the oldest recorded farms in Croxley. Ralph Pyrot was listed in 1248. The Close leads to Parrotts House which was probably built in the sixteenth century and has been altered and extended. Other roads in this group are Claremont Crescent; Dulwich Way; Fuller Way; Girton Way; Lancing Way; Malvern Way; Rugby Way; Sherborne Way; Winchester Way; Winton Approach; Winton Crescent and Winton Drive. The Durrants Farm Estate which was sold in 1932/1933 led to the slow development of the area between Baldwins Lane and Little Green Lane at the hands of a number of different builders and at different times, hence the eclectic and varying styles which are found today. The roads in this development took their names from famous historic towns and cities. Building was started in the 1930s but interrupted by the Second World War which brought all building work to a halt and hence these roads were not completed until much later. Other roads in this group are Canterbury Way; Dover Way; Hastings Way; Kenilworth Drive; Lewes Way; Lincoln Drive; Lincoln Way; Ludlow Way; Norwich Way; Rochester Way and Warwick Way. The Durrants Farm Estate which was sold in 1932/1933 led to the slow development of the area between Baldwins Lane and Little Green Lane at the hands of a number of different builders and at different times, hence the eclectic and varying styles which are found today. The roads in this development took their names from famous historic towns and cities. Building was started in the 1930s but interrupted by the Second World War which brought all building work to a halt and hence these roads were not completed until much later. During the Second World War an incendiary bomb fell here on 13/14 October 1940. Other roads in this group are Canterbury Way; Dover Way; Hastings Way; Kenilworth Drive; Lewes Way; Lincoln Drive; Lincoln Way; Ludlow Way; Norwich Way; Richmond Way and Warwick Way. The lane probably gets its name from Henry Rowce mentioned in 1527. In 1766 the lane is listed but spelled Rowsbarn, then in the following decade was known as Rosebarn, the pronunciation which is still used locally. Rousebarn Farm stood on the corner of Rousebarn Lane and Little Green Lane. Off Rousebarn Lane a road led to a large private home, Cassiobridge House, which was demolished in 1965. A house has stood on this site since the late eighteenth century. During the 1920s and 1930s there were extensive orchards of apples, damsons and pears with a large greenhouse containing grapes, and a prosperous poultry farm. The grounds stretched from the West Herts Golf Club to the canal. In 1939 the house was sold to the Associated British Film Distributors as their headquarters and storage depot. When they left the house was demolished and the only remains today are the garden walls. After many years of traffic problems Rousebarn Lane was closed to through traffic in 1993. In the 1930s development of the former Parrotts Estate land, between New Road and Baldwins Lane, many roads were named after Colleges and Schools. Building was started in the 1930s but interrupted by the Second World War which brought all building work to a halt and hence these roads were not completed until much later. The development was by a number of different builders and at different times hence the eclectic and varying styles which are found today. Other roads in this group are Claremont Crescent; Dulwich Way; Fuller Way; Girton Way; Lancing Way; Malvern Way; Repton Way; Sherborne Way; Winchester Way; Winton Approach; Winton Crescent and Winton Drive. The name is reputed to have once belonged to the family of Simon le Skote who lived at the time of Edward Il. 'Scottesbridge' was named in a legal document of 1556. This area with the Green is the oldest part of the village. The Sportsman Public House, which was occupied in 1838 by Thomas Blackwell as a house and yard, was not definable as a Public House until 1870. The Plough and George and Dragon public houses were two hundred yards apart and were demolished simultaneously. There were also several cottages and a thriving blacksmith along here. Cherry Cottages remain today. 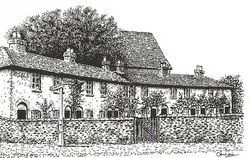 In 1954 Rickmansworth Grammar School was opened on the site where a large house called Briery Close, known locally as 'Fanny Barkers' once stood. The house was renowned for its fine gardens and it was the home of the Reverend Alleyne Higgs-Barker, Vicar of Rickmansworth. After his death it was left to his daughter Miss Fanny Barker, an eccentric who lived there with one brother and three sisters for many years. Just before the Second World War the house was left unoccupied and it became a playground for children by day and a refuge for tramps by night. When the house was demolished it became the site of the village pleasure fair. The roadway was developed into a dual carriageway in 1973. The hill had always been very steep and it was not uncommon for buses to get stuck, or for passengers to disembark at the bottom and walk up. Chalmers Court is a new development of flats built for the British Legion Housing Association Limited. The first residents moved here in February 1979 and the official opening by Colonel J. Hughes was on 11 May 1980. At the bottom of the hill is Scotsbridge Mill, a corn and fulling mill documented in 1692 and converted to paper in 1757, continuing until 1885. In 1914 the mill was producing photographic and dye-line paper until a postcard business took it over in the 1920s. In 1927 MGM moved in and were using the mill to make cellulose acetate for films and the building itself featured as a location in several of their films. Scotsbridge Mill became the MGM headquarters in Britain in 1940 and continued until 1973. Cygnet Press then used this site for the next ten years until they left and the mill became derelict. 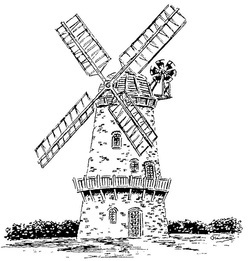 The mill was renovated in 1989 and opened as the Scotsbridge Mill Beefeater restaurant on 5 October 1989. 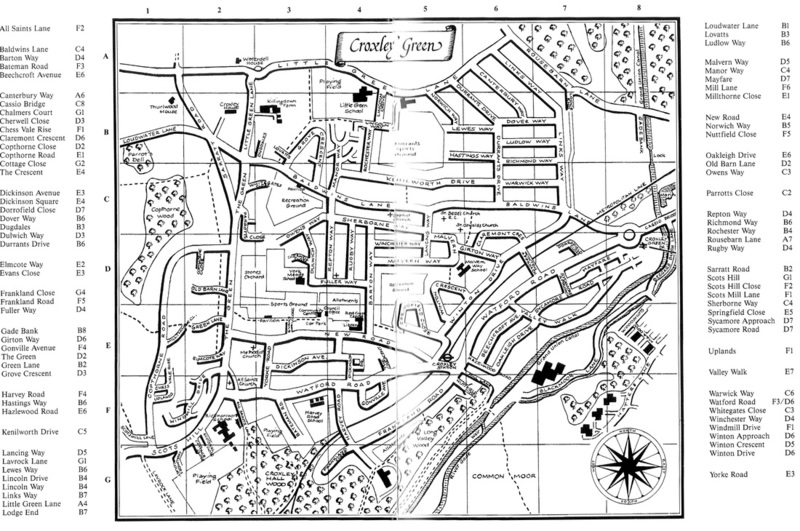 In 1960 the developers of this cul-de-sac suggested it should be called Scots Hill Close, Nursery Close or Colne View. Other roads in this group are Claremont Crescent; Dulwich Way; Fuller Way; Girton Way; Lancing Way; Malvern Way; Repton Way; Rugby Way; Winchester Way; Winton Approach; Winton Crescent and Winton Drive. Built in 1926 along with Rickmansworth U.D.C. Springwell Avenue in Mill End. A local field name which may well have encompassed the Springfield Cottages in New Road. A development of three modern detached homes that were built in the late 1970s. Until then it had been only an access between Sycamore Road and Watford Road. Other roads in this group are Beechcroft Avenue; Hazelwood Road; Oakleigh Drive and Sycamore Road. This road was originally known as Sycamore Avenue which comprised of four detached houses and then formed part of the development in the 1930s on fields between Watford Road and the Grand Union Canal. This land was formerly part of the Cassiobridge Estate owned by Gonville and Caius College. In common with other areas of Croxley the development was interrupted by the Second World War which gives a mixture of styles of houses. When building resumed in the 1950s this road was extended and the name changed to Sycamore Road. The next stage of development came later in the 1960s when Kebbell Developments Limited built a large estate down to the Grand Union Canal. The roads in this area were all named after trees. Other roads in this group me Beechcroft Avenue; Hazelwood Road; Oakleigh Drive and Sycamore Approach. This is a new development off Copthorne Road. This road was begun in the 1930s on land which was formally part of the Cassiobridge Estate owned by Gonville and Caius College. In common with other areas of Croxley the development was interrupted by the Second World War which gives a mixture of styles of houses. When building resumed the road was extended further on fields, which formerly had been allotments, parallel to the Grand Union Canal. The extended part of the road was then called Laburnham Avenue. When the Kebbell Estate was developed in the 1960s the road was further extended and the whole length reverted back to its original name of Valley Walk. The Durrants Farm Estate which was sold in 1932/1933 led to the slow development of the area between Baldwins Lane and Little Green Lane at the hands of a number of different builders and at different times, hence the eclectic styles which are found today, The roads in this took their names from famous historic towns and cities. Building was started in the 1930s but interrupted by the Second World War which brought all building work to a halt and hence these roads were not completed until much later. Other roads in this development are Canterbury Way; Dover Way; Hastings Way; Kenilworth Drive; Lewes Way; Lincoln Drive; Lincoln Way; Ludlow Way; Norwich Way; Richmond Way; and Rochester Way. The road was originally listed as Croxley Green Road in 1898 and it stretched from Cassiobridge Hamlet to the Green. It was once part of the old Hatfield to Reading Trust 1770 turnpike road, which expired in 1880. This road is a typical example of 'between-the-wars" ribbon development along a main road. The original Croxley Green L.M.S./ British Rail station serving Watford West, Watford High Street and Watford Junction opened here on 15 June 1912. A freight service began on 1 October 1912. On 10 March 1913 Croxley Green station buildings and platform were totally destroyed by a fire thought to have been started by suffragettes. The electric service commenced on 30 October 1922. Slowly over the years the services from this station were run down for various reasons, including the coming of the Metropolitan Line in 1925 with a new station which was much nearer the centre of the village. Croxley Green goods services ceased from 14 November 1966. The rotten original platform was demolished in 1989 and the service is now limited to peak-time only. The Two Bridges Public House stands on the previous site of two large cottages at the junction of Watford Road and Baldwins Lane. The Red House is another old public house with modern additions which stands on the corner of New Road. The Duke of York Public House was opened in 1870/1880 and used to be called the Gladstone Arms, changing its name when Garden Road became Yorke Road around 1900. The road and shops developed as a result of the Metroland expansion after the Metropolitan Railway opened in November 1925. Croxley station was designed by the company's architect C. W. Clark. It is a two-storey structure situated on the bridge which carries the main Watford to Rickmansworth Road. Opposite the station on the Winton Drive side. once stood a row of cottages which were destroyed during the Second World War. The site was left empty for years, then used as a taxi rank until the present flats were built. Further along Watford Road are Lindiswara flats built in the mid-1960s on the site of Lindiswara House which was built originally for the manager of John Dickinson's Mill. The old Boys School stands next to the Duke of York Public House. In 1894 Yorke Road village school was so overcrowded the boys were relocated to this new school. After the opening of Durrants School and Harvey Road School in the late I930s the school was used for various overflow forms from other schools until it became Sherwood School. Built in 1970s and takes its name from the house previously on this site. In the late 1980s Kibswell Homes built an additional six detached houses around a large oak tree naming this end of the road Kings Oak. Other roads in this group are Claremont Crescent; Dulwich Way; Fuller Way; Girton Way; Lancing Way; Malvern Way; Repton Way; Rugby Way; Sherborne Way; Winton Approach; Winton Crescent and Winton Drive. 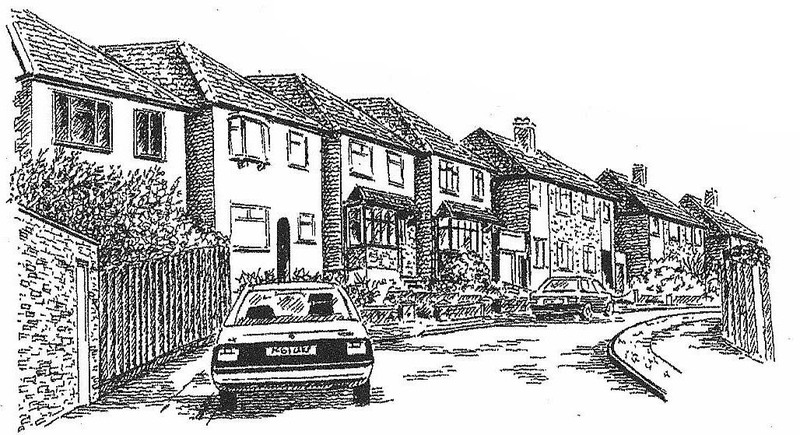 Developed in 1974 this road of detached houses, semi-detached houses and flats was built around Croxley's windmill. 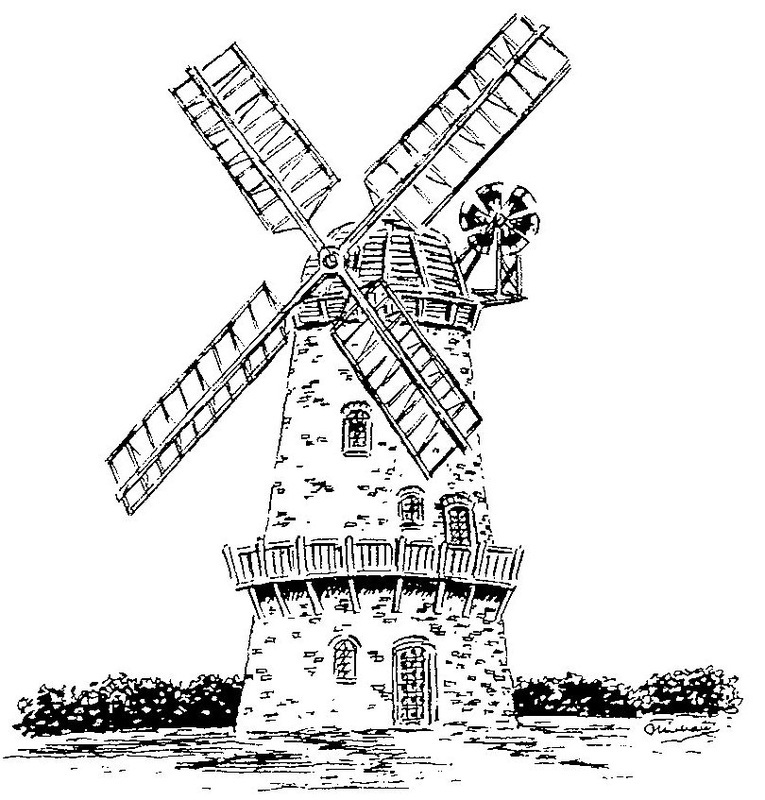 The windmill was built in 1820 to grind corn - it was a tower mill which had four patent sails, a wooden cap and a fantail. Its sails were badly damaged in the Great Storm during the 1880s and it ceased to operate when the last miller, Ephraim Holloway, died in 1890. A steam engine was installed and provided power for a sawmill and turnery until the 1920s when it was closed. During the Second World War it served as a warden post and an air raid siren was installed. In 1964/1965 it was completely cleared out and converted into a private house. In the 1930s development of the former Parrotts Estate land. between New Road and Baldwins Lane, many roads were named after Colleges and Schools. Building was started in the 1930s but interrupted by the Second World War which brought all building work to a halt and hence these roads were not completed until much later. The development was by a number of different builders and at different times hence the eclectic and varying styles which are found today. 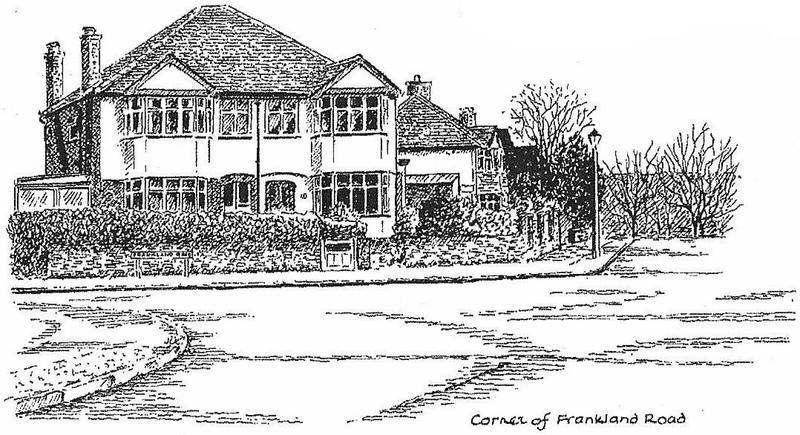 During the war the British Restaurant was located in Winton Drive and Winton Crescent was hit by one of several incendiary bombs which fell on Croxley between 13/14th October 1940. Other roads in this group are Claremont Crescent; Dulwich Way; Fuller Way; Girton Way; Lancing Way; Malvern Way; Repton Way; Rugby Way; Sherborne Way and Winchester Way. Originally known as Garden Road it was renamed in 1898 in honour of Charles Frederick Yorke, former Chairman of the Rickmansworth U.D.C. He lived at West View near All Saints Church and owned land on either side of the road. In 1873 Croxley's first school was built here on land given by John Dickinson. (comment: It is now believed the land was purchased from Mr. Peddle, a carpenter in Mill End). It opened in 1875 with one hundred and twenty children and soon needed enlargements, which occurred in 1884. 1889 and 1894 when the total number of pupils had risen to two hundred and ninety six. In 1894 the school split into boys and girls; the boys moved to the new boys school in Watford Road. By 1938 the combined number of pupils had risen to five hundred and seventy and when fire partially destroyed the building the managers decided to hand over the schools to the County Council rather than build another extension. Senior pupils were sent to Harvey Road into hastily erected wooden buildings and the juniors stayed at Yorke Road. Land was bought on the Durrants Farm estate and a new school named Durrants was opened in 1939 for the senior pupils. Harvey Road continued as a junior school and Yorke Road housed the infants until Yorke Mead School opened in 1974. The old Boys School was used for overflow pupils from Harvey Road and later as Sherwood School. When a decision was taken to move Clement Danes School to a greenfield site in Chorleywood, Yorke Road School was used for the first intake of about eighty eleven year olds in 1975/1976 because the new buildings were not ready for occupation. Today Yorke Road School is used by Leukaemia Research Fund Cards. The information below is an update to the book A history of Croxley Green through its street names - by Shirley Greenman. The additional Information covers roads that were built after the book was first published and covers the period 1996 - 2013. It also has updates to certain roads and areas. This estate was developed by Barratts between 1998 and 2002. The site was originally occupied by John Dickinson's Croxley paper mill and later by Marconi Systems. The street names either have connections with Croxley Mill or describe their position. Basildon Close is named after Basildon Bond - a notepaper produced by John Dickinson. In 1911 the first "bond" notepaper marketed at one shilling (5p) a unit. The name of an old field name. Along the side of the Grand Union Canal. C R Gill was the Export Manager at Croxley Mill in 1903. Institute. Together with his wife he organised plays and children's New Year entertainment. Charles Longman married into the Evans/Dickinson family. The Watermark was the last part of the development begun in 2002. This site off Dickinson Square was developed in 2001 by Michael Shanly Homes and was previously a cherry orchard. Parish Office which was named in 1997.
was made a Conservation Area in 1996.
opposite All Saints Church in 2010. A cul-de-sac off Hazelwood Road. Named in 2004 this development lies where numbers 32-36 Hazelwood Road used to be and was named Hazel from Hazelwood and Bank from the name of the former occupants.